Nokia is a Finland based mobile phone manufacturing company. This year, the company has announced and launched some of its latest devices that have received huge appreciation. 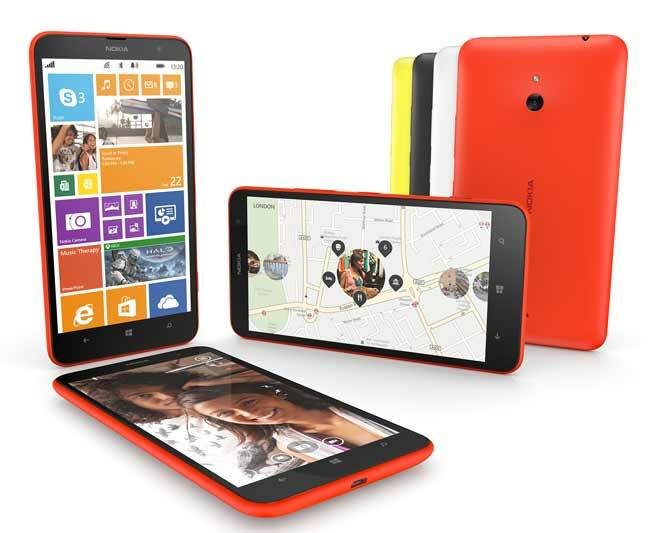 At Nokia World in Abu Dhabi today, the company has launched its first budget phablet, the Lumia 1320. It is the company’s answer to the likes of the Galaxy Mega 5.8, Galaxy Mega 6.3, Micromax Canvas Doodle 2 and the likes. The phablet will be available for around Rs 22,000 when it gets launched in India early next year. Built: The dimensions of this device are 164.25 x 85.9 x 9.79 mm and it weighs approximately 220 grams. The device is a bit heavy but brings quite a good build quality to the table alongwith a gigantic screen, so this much can be let go in case of the smartphone. Display: The Lumia 1320 comes with a capacitive HD IPS LCD touch display of 6 inches with a resolution of 1280 x 720 pixels. It comes with Gorilla Glass 3 protective screen and offers super sensitive touch support for nail and glove use. 720p may seem a bit overstretched but you can’t expect better at this price point and even WVGA resolution looks well on Windows devices, let alone 720p. Processor: This device has been equipped with a Qualcomm Snapdragon 400 dual core processor clocked at 1.7 Giga Hertz. Thus, clearly indicating that it’s mean for a strong mid ranger in terms of performance. Operating System: This device will run on Windows Phone 8 platform. The OS is gaining popularity slowly and will soon be one of the major forces to reckon with. Memory: The Lumia 1320 features a RAM of 1 GB and internal storage capacity of 8 GB. It also offers expandable memory of up to 64 GB along with 7GB of SkyDrive Cloud storage. That’s what you get in every other mid ranger so no complaints regarding this. Camera: This device features a primary camera of 5 mega pixels with LED flash and auto focus. It enables you to make 1080p videos. It also offers a front facing VGA camera of 0.3 mega pixel. The rear camera could have been a better unit, probably the one on the Lumia 720. Connectivity Features: The Nokia Lumia 1320 comes with a range of connectivity features, such as 3G,, Bluetooth 4.0, Wi-Fi and micro USB. So it’s all sorted in this regard. Battery: This device will function on a powerful non removable battery of 3400 mAh and we really like this part about it because its quite a mammoth battery and will easily last over a day on a single charge. Our Take: The Nokia Lumia 1320 offers a wide range of exciting features and awesome services. It is bound to receive good response and garner positive feedback. The Lumia 1320 will to be a tough competitor to beat. And for around Rs 22,000, it does not get better. That’s what I feel, do let me know as to what do you. Nowadays the camera is a very important factor for lots of users. At Rs. 22k, Nokia is offering a 5 mp primary camera? 🙂 What people mostly do with mobile phones apart from handling calls? What I see is, mostly listening to music, watching videos, taking photos and social networking are the primary uses. Oh yeah, some people do gaming. I think Nokia has overpriced this thing. What is good is that 6″ screen with HD IPS display on Gorilla Glass 3. Well its no doubt that the device is completely awesome and at this price point a phablet with such awesome features at such a price tag made by nokia is simply wothful. all what is required is apps ,come on developers give windows phone a chance and it would pay you much more than android on a long term basis.